Dachshunds have some unique behaviors to their breed. But what do they mean? I’ll start by saying that many of these behaviors can be traced back to the fact that Dachshunds were bred to be hunting pack dogs. 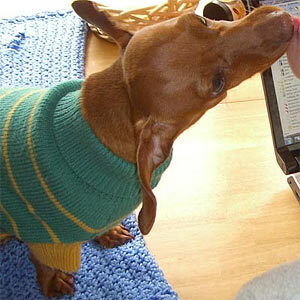 Why do Dachshunds love to lick your face? In an earlier post, Why do Dachshunds Love to Lick Your Face, you can read in more detail why they do, in fact, love to lick your face. To sum it up though, Dachshunds love to lick your face partly because they may be looking for food scraps. Another reason is acknowledging you as a pack leader. They see you as the pack leader, the alpha dog, returning from the hunt. So, basically, they want to see what you caught during your hunt. Your Dachshund is simply doing what he was bred to do. It’s in their genes. Although, I think we all like to think of them as ‘kisses’! Dachshunds Are Led By Their Nose! Every time I let my dachshund outside to do ‘potty’ or to go on a walk, he smells and noses around with his nose to the ground. I pretty much have to ‘remind’ and ‘redirect’ him that he’s out there to do potty (not to smell every single blade of grass!). Why does he do this? This is completely normal behavior for a Dachshund. His/her ‘hunter’ instinct has just been activated. Outside, in his yard, he automatically will start to search and sniff around his territory. Often times all they need a little redirection when their nose takes over! Sometimes when my Dachshund is outside, I notice he will stop in his tracks, lift up his front paw and just stand there. Why does he do this? Once again, the Dachshund is displaying normal behavior. His hunter instinct has kicked in again. I swear my doxie, Grace, can taste the aroma around my mouth after I’ve eaten something! There is no food on my mouth, but she has a ball “tasting it,” although no traces remain. Once I have finished eating my meal, she is free to pick up any traces of food that have fallen on my lap or chest, and believe me, she knows the rules! Thank you! I found out just what I needed to know! We rescued a doxey mix without any knowledge of the breed. She is wonderful and responds well to positive reinforcement. Marley is 8 years old–the family baby for 7 years. Now that we have an 8 month old daughter, we are having problems with Marley sometimes growling/snapping at the baby. She has also begun to have potty “accidents” right in front of us, often after just going out and pottying outside. Any suggestions/insight into these behaviors and how to handle them would be appreciated. @Jo, The dog is feeling slighted, and somewhat jealous. Try giving him a little more attention during this time. Unless you catch the dog in the act of pottying inside, there’s no scolding him. IF you catch him in the act, then IMMEDIATELY scold and bring him outside to his spot. It will take patience. Be careful regarding the snapping. 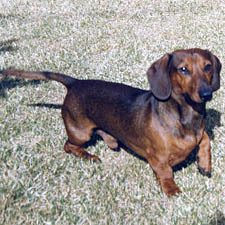 Dachshunds can be a snappy breed. Be sure your baby is protected until the dog becomes more adjusted to the new situation. Here’s the overall thing… the dog must know that YOU are the pack leader (they are all pack animals). If HE thinks HE is the leader, then things are difficult. If he knows that YOU are the leader, and you are ‘allowing’ the baby into his home, then eventually he should ‘get it’. when in high spirits,,, out of doors, their hunting instincts are never dormant … Thank you ! My mini dachund likes to walk in the grass and sniff out slugs and bugs. When she finds some, she will roll around on it, and then she doesn’t smell too rosy anymore. I’m wondering if she would eat bugs if she could? this really helped me a lot now i know what my dog is doing. We took our Rylie from a friend who didn’t have the time to spend with him. He is now 12 months old and a lot of fun. After reading a ton of information about him including this article and comments I feel like I have done a decent job helping him learn to potty outside!!! At least in the morning. We are still working on the afternoons and trying to figure out his signals. However, after 3 months with him he has improved 10 fold. We also don’t yell when he barks so we are not joing the fun. I have to remember to always be the pack leader and to let him know my family is above him in the ranks. Dog training will begin very soon (with a trainer to help us). Thank you to everyone who has posted ideas and successes. How do we get our dogs not to bark when someone comes over? My 5yr old PennyLane starts pawing on everything, and her ears fold back. Its like she is having anxiety. She looks depressed. Any idea’s ! Our 5 year old Roscoe doesn’t bark much. He will bark at strange men coming around,however any woman stranger or familiar will get a roll on the back position exposing himself.He begs for his chest to be scratched by waving both his paws in the air as if to direct you to scratch him.He is so funny.He too hangs his paw in the air “pointing” not at a badger or any animal ,it’s to beg for cheetos.He also stands in front of the refrigerator waiting for crushed ice chips to fall whenever someone uses the ice maker. Our biggest problem with him is “licking”. Not so much himself ,but everything else.His breath is horrible because of it.I constantly buy breath freshing products ,they don’t help.I get his teeth cleaned at the Vet annually. Any suggestions on what to do about his bad breath? Oh, we’ve changed the diet several times,but its the licking we are convinced . My daschund hax very bad breath and i took her go the vet she had tarter on her teeth. The vet gave me something for her it cost 30$. It helped the tarter and she has no more bad breath. We have a dachshund/chihuahua mix who’s the sweetest dog we’ve ever owned. He loves to lick just about anything and we often have to gently remind him where he can and can’t do this behavior. Sometimes he catches on and sometimes he doesn’t. Often he just can’t overcome this powerful urge – it’s almost reflexive and a self-soothing behavior especially as he’s falling asleep. I honestly doubt the halitosis is from licking. Dachshunds are prone to gum disease and once a year cleaning may not be sufficient, especially if he’s not a puppy anymore. Ours was a rescue and had to have a lot of expensive extractions because no one cared for his teeth before we got him. His dentition was a hot mess and his breath was awful. Now he loves his poultry-flavored enzymatic toothpaste. 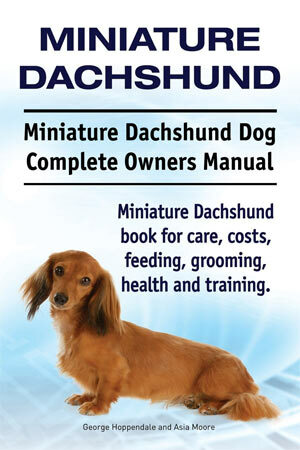 You can buy it at any good pet store or on-line. Not cheap but you only need a tiny bit each time. I go through maybe 3 tubes/year and that’s with daily brushing. He stands still on the bathroom vanity while I do a quick brush front and back with just a tiny bit of paste on a brush specially made for dogs. Takes less than a minute. Plenty of vids on You Tube to show you how to do it. It’s made all the difference since I started daily brushing. Why not see what advice the vet can share? Good luck! my daschund has this habit of walking over my neck with her front two legs making sure not to step on my neck when im laying down of course then when my neck is under her body she roll over on my face and just kind of stay there if i let her. I am wondering what this means. Not sure, but maybe it’s an attempted sign of ‘dominance’ over you (which might not be a good thing to allow). Or, maybe your dachshund is simply seeking the warmth? That sounds pretty normal. Ears have individual, distinctive scents that humans may not be able to sense but dogs can. From a doggie-brain perspective, it’s just welcoming you back into the pack. If the licking is bothersome, you can always gently push its mouth away from your ear when it licks. After doing that several times, it should get the message that you’d rather not be licked. But if you don’t mind it, then it’s harmless behavior. Mine always, and I mean always, licks my hand once or twice when I return home, even if I’ve only run out for a few groceries. He’ll follow me around until he can get in that one hand-lick – it’s pretty cute. Can anyone help,, recently my Doxie who is a male now 5 years old longhair Blacktan, started having a grouch growl moment, not in a vicious way, showing his teeth more recent tonight…then straight after wants to give me love and kisses, making a groaning noise, so wierd can anyone shed out light to this, recent events I’ve just lost my mom, and my new partner of nearly 12 months moved in 8 months ago, the grouchy moment s have only just started last couple months, but it’s happens every evening for some wierd reason, never during the day? Thanks any help or answers would help ,,,? Hmmm, not sure. Is he growling at YOU? or just in general? Is he trying to tell you something (ask for something?) Jealous for any reason maybe? If it’s bad behavior, when you catch him in the act, immediately and firmly say “NO”. He needs to know that you are the alpha.